So, what's the first thing you reach for when cold or flu symptoms knock at your door. Actually I had been thinking about this post since the beg. of Nov. but lazy me or let's put it in this way one by one kiddos & me getting sick and all the festivities going on(Nov. to first week of Jan.), never got around to write this post. But I believe it's still not too late as we have cold weather going on and cold days means more cold & flu cases(as I'm writing this again got cold, hope it won't last long with all the stuff I'm going to share with U guys today, Yes! home remedies worked again). Below are some of the home remedies I have been relying over the past few month and have been using these from few years now.. My older one did took 2 doses of regular pain reliever as she was crying but other than that these home remedies did took care of our sore throat, cough & cold symptoms(runny nose & headache etc. ), possible ear infection & fever. Disclaimer : I would like to tell my readers that these remedies are practised by me & my family for years and we rely on these as they have been quite effective for us. If you or your child is not well, please seek the assistance of a competent health care provider. I or this blog is not responsible in any way. 1) COUGH : In case of first signs of cough I always start my family on this tried & tested home remedy of honey & turmeric which is not only anti-inflammatory but is also a natural antiseptic and anti-bacterial too. For ages Turmeric has been used in India as an instant antiseptic & anti bacterial to deal with wounds, cuts & cough, cold.. I believe it's better to take some sort of natural anti-biotic when ever cough & cold starts so that possibility of having infection can be reduced. 2) COLD : Same way cold in my family calls for raw garlic. It also comes under the category of natural anti-biotic, anti-fungal and anti-viral food. Some of U might find it difficult to eat, Yes! U gotta eat one small clove of garlic. You don't have to chew on it but cut it into small pieces & swallow them with some warm water, twice in a day, once in the morning & once before bedtime. If it's too big of a clove take only half of it at one time, also the big clove usually have inner part (sometime which is greenish kind), in that case take inner part & discard it as that can cause indigestion. If U have a sensitive stomach eat it with some food, don't eat it on empty stomach. In my family we all eat it empty stomach specially the morning dose. When to start taking it, when U get that first sign of cold knocking on your body in terms of little tickle in your throat, runny/stuffy nose or U just know it with that sneeze that cold is coming. 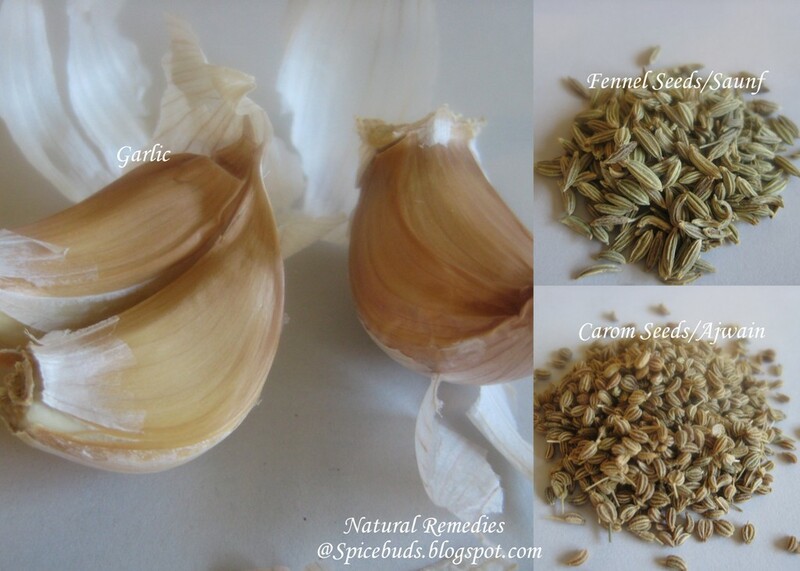 Keep taking it till the cold bug is gone as garlic helps in building the immune system in general also. 3) FEVER : Now coming to the another symptom which is kind of next stage of cold is fever. Last month as I mentioned above we all were sick one by one so here's the story how it started..... on a weekly grocery trip, while I was waiting in the check-out line, my little one playing hide & seek behind the big metal pillar(big enough for a 3 yr. old to hide behind), when she didn't show up after may be 30 sec. of hiding I looked back the pillar to check on her & she was licking the pillar. I know, I know it's gross, but that's what she did and next day she fell sick. She do get little cold occasionally because she won't wear warm clothes and I normally take care of that with this home made decoction but this time it was fever & cold. I immediately started her on fennel/saunf tea & ajwain/carom water alternating them every couple of hours. I don't exactly remember from where I picked this fennel tea remedy but It's simple & no harm kind so I don't see why not to use it. It's simple take 1 cup of water & roughly 1/2 tsp. of fennel seeds, boil them till the water is half in quantity, strain, cool a bit. Same way make ajwain water. I gave her couple of tablespoon of this decoction alternating it with ajwain water, repeated thru out the day. Made these mixtures twice a day, continued her on these teas for couple of days and from third day kept her on only ajwain water. In case of adults half a cup can be taken twice a day. Do not make a big batch of these teas as these are more effective when used freshly made, if U are really busy may be make it for a day, keep it in the fridge, warm it a bit before using it & discard any leftover by the end of the day. Note: I've been using this fever reducing remedy since last 4 years or so for my kids. For my now 9 yr. old I do sometime use conventional medicine(minimum dose) along with this remedy, and I believe it does fasten up the recovery process. Take a red onion & bake it for around 45 min. to 1 hr. on 350-400 degree. I used only half a onion as it was big & I needed it for child only. I used bake setting on my toaster oven for this purpose. Cover the jar(from bottom) with sock & fold it over so only mouth part is open, this is just to make handling of the jar/mug easy as once U put hot onion in it, it's gonna be difficult to handle it. Alternatively wrap a hand towel around the jar. But I felt sock method much better so my 3 yr. old could also hold it. Once the onion is baked, use tong to handle it as it's gonna be very hot. Put it into the jar using fork prick some holes in it to release the heat. I just used knife to make some cuts. Now, hold this jar/mug next to your ear that is in pain. It's better if U can cover your ear with the jar opening but first make sure that steam coming out of it is not too hot. Take that steam for around 10-15 minutes or till it's there. There's one more thing I'm really a big fan of : Essential Oils, specially during this time of the year but that's for the another post. So stay tuned in. How about you, do you have any natural remedy for cough, cold and flu season which you would like to share with us here. "A Very Very Happy New Year......Hope 2012 brings lots of happiness around the world"
And to contribute a little to this happiness around the blogging world, I have something to share with you guys, I have been visited by Fairy Hobmother, Yes! U read it right Fairy Hobmother, of Appliances on line was here last week to inform me that I won little prize in the form of Amazon gift card(Isn't it a good start to 2012) and also told me that she loved my Eggless Chocolate Banana Cake with Toffee Bits. Now coming to the happiness part, so, Fairy Hobmother told me that she's on the spree to spread some New year cheers among the bloggers. Now, those of you who would be interested in a visit from a Fairy and have a wish granted please leave a comment on this post with your wish for Fairy Hobmother. Sometime soon she will be visiting here to check the comments. what are U waiting for??? check the recipe for the soup below & go to the comment page and U never know......."Dreams do come true". Note : roasting veggies is totally worth the effort, as it does give very good flavour to the soup. In a baking sheet arrange veggies from roasting category & sprinkle them with olive oil & salt. Use your hand to rub oil & salt onto them,arrange them in a single layer. In case of bell peppers keep the cut side down. Place it in a pre heated oven for around 25 minutes or so at around 400 degree F. In my case I usually use my toaster oven for this purpose, no pre heating required & also saving on electricity by not using the big oven. While some of the veggies are roasting. Clean & wash rest of the veggies. Roughly chop them. Take a large pot or pressure cook( that's what I use), heat it & add olive oil followed by bay leaf & cloves. After few seconds add chopped up garlic, all the veggies & saute them for few minutes. Add 4 cups of liquid, salt & black pepper. If using vegetable/chicken stock with sodium adjust the amount of salt or better don't add any extra salt. Boil it covered till all the veggies get soft. In case of pressure cooker I put it on slow flame till one whistle & then turn the gas off. Once the steam is all gone open it. Check for roasted veggies, once they are done put bell peppers in a bowl & cover them, let them sit for around 10 minutes. This process will make the peel loose off from the peppers. Once they are cool enough to handle just take the peel off & discard it. Combine all the veggies (boiled & roasted ) fish out the bay leaf & discard it, once the veggies are cool enough puree them using a hand blender or food processor. Strain it for smooth texture or let it be like that for little rustic kind. Adjust the seasoning, add little butter and serve it with your favourite toasted bread or better, plan ahead and have fresh one ready. Note : another version of this soup is by roasting all the veggies, specially if U r using big oven for roasting purpose. Reminder : Do not forget to write your wish in the comment section.....Fairy's do exist.